The seats slide on the black runners to adjust the weight to get the right trim. Power is either 30lb thrust electric outboard or 3.3hp outboard. It rows easily as well. 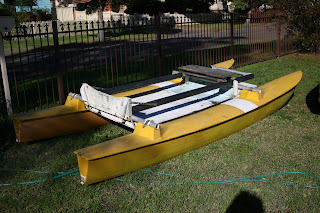 This is a stable platform and will be used for photography on the local river, The Shoalhaven. It is 12 feet long.There is four fishing rod holders. Fully loaded it draws 300mm. There is room to sleep between the black bars when the seats are removed. Plastic boxes are tied to the black bars to hold all the gear for the trip and these rest in the top yellow hulls. It’s looking really nice and all geared up for your journey. :) Oh, a photoshoot at the Shoalhaven? What project would that be? I’m curious. 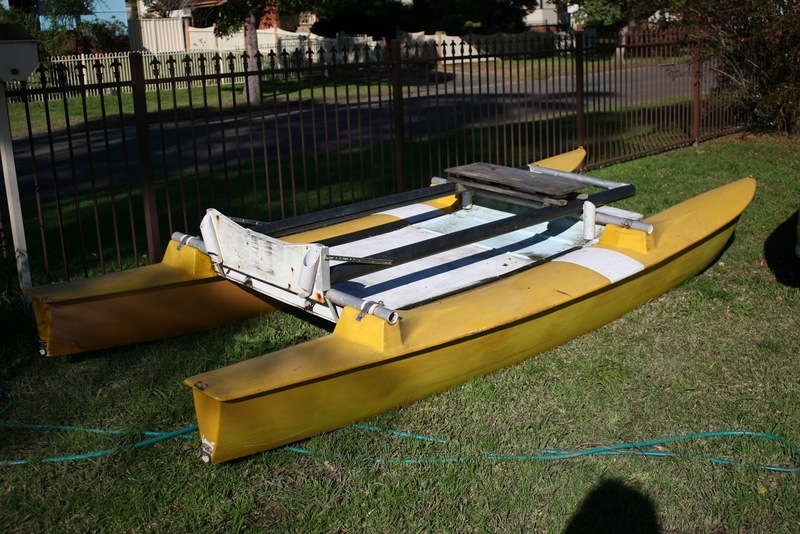 :) Hope you update us on how your project went and how your new boat performed.